Request a quote for a bulk order for RFX-AP polyclonal antibody - Classic. Please fill out the form here below. Your local sales account manager will get in touch with you shortly and send you a quotation based on your requirements. Polyclonal antibody raised in rabbit against RFXAP (Regulatory factor X-associated protein), using the recombinant protein. * Please note that of the optimal antibody amount per IP should be determined by the end-user. We recommend testing 1-10 μg per IP. ChIP assays were performed using NALM cells (a cell line derived from human pre-B leukemia), the Diagenode antibody against RFXAP (cat. No. pAb-061-050) and optimized primer sets for PCR. Sheared chromatin from 2 million cells and respectively 5 and 7 μg of antibody were used per ChIP experiment. An anti-flag antibody (lane 2) was used as negative IP control. 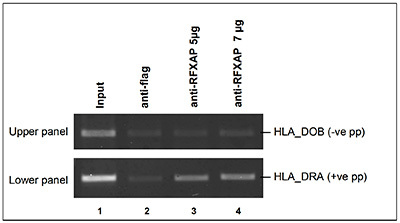 Figure 1 shows the result of the end-point PCR with primers for HLA_DRA, used as positive control (lower panel) and for HLA_DOB, used a negative PCR control (upper panel). Diagenode strongly recommends using this:	RFX-AP polyclonal antibody - Classic (Diagenode Cat# C15410061 Lot# 001). Click here to copy to clipboard.